Jewelry trays are one of the most customary and wide spread ways of stacking, displaying, storing and organizing jewelry items in any jewelry store. They offer a great variety of design, color, shape, size and style that will prove to be very useful to have around the store. They can sort your items in an efficient and intelligent way that will help you store and display them before your customer with more ease and elegance. Most jewelry trays are part of jewelry cabinets, organizers, drawers and so on and so forth that are also meant to keep safe items of jewelry, yet they can be used on their own as well. They do not take up much space, thus making them very space-efficient and allowing their use in even more crowded display cases. They can be placed anywhere around the store for the elegant and professional exhibition of your items of jewelry as well. Their simplistic yet chic and occasionally interesting design makes them ideal for jewelry stores. They are not too colorful, not overly decorated, not too complicated or intricate and they are not kitsch either, therefore making them perfectly elegant and neatly designed. If you are looking for ways of both displaying various items of jewelry and also sorting them with efficiency and ease, jewelry trays are definitely the answer. They are compact, smartly designed, well and diversely compartmentalized and they will surely prove to be very satisfying to have around, regardless of the purpose you intend to use them for. Jewelry display trays offer a wide range of designs, storing abilities and professional styles that is suitable for any self-respecting jewelry store. They will definitely be very satisfactory in carrying out their purpose and they will surely fit in with ease with any kind of interior decoration. 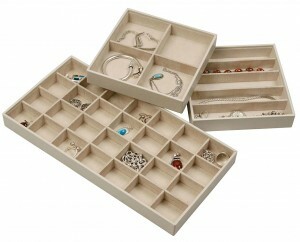 Utility Jewelry Trays are a simple yet highly effective way of stacking and arranging your items of jewelry. They come in various sizes and they are usually rectangularly or square shaped. They are either equipped with multiple slots of diverse size or they are empty trays so that you can place any kind of item on them. Given their simplistic style, they can be integrated in any kind of exhibition set. They can be found in plenty of colors yet the most common colors are black and white. There are also many other beautiful shades that can be styled up with the type of decoration you that you intend to have in your store. They are compact, easy to transport and arrange and they provide a very facile and useful way of displaying all sorts of jewelry, from smaller sized items of jewelry to larger sized ones; utility jewelry trays are beautiful in a simplistic and classy manner. 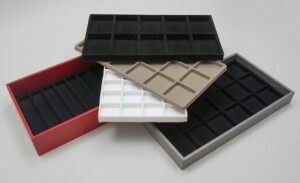 Compartment Trays are the kind of trays that are featured inside numerous jewelry boxes, cabinets, drawers and so on. They come in a wide variety of style, colors, design and sizes. They are usually divided into variously sized slots as well that will provide a perfect accommodation for any kind of jewelry item. They are usually made of soft and fine materials that aim to protect the more fragile items of jewelry and to keep them from getting scratched or damaged in any other way while they are stored inside of the boxes or drawers. They are generally embroidered with satin or velvet in order to protect the jewelry. Compartment trays are great for the exhibition of jewelry in jewelry store’s window case or you can just as easily arrange them in your store on a vanity, dressing table, desk etc. They can also be used with their jewelry box sets as well. Jewelry Tray with Compact Lids refer to trays that are part of display boxes, cases, cabinet and anything similar that are entirely nontransparent; they have to be opened in ordered to display the contents of the boxes yet they provide a better and more secure storing and display as well. They obviously come in various colors in order to match the style of the boxes or trays or of the store. They are usually rectangularly shaped or square shaped as trays usually have geometrical forms. The compact lids offer a far better protection than any other kind of lid and they can also be engraved or embroidered with gorgeous patterns, motifs and designs that will definitely catch anyone’s eye. They present your jewelry items in an elegant, safe and reliable manner and they will surely prove to be very useful and convenient to have around the stores as they are stylish, elegant and highly efficient. Jewelry Trays with Clear View Lids are the type of jewelry tray that are completely see through, therefore they provide a clear and accurate look at the contents displayed in there. They are a very well spread manner of jewelry display and they are usually very popular in the window cases of jewelry stores. They can easily present the jewelry items they are stored without even lifting the lid, thus making them very useful and convenient. They can still protect the products therein while exhibiting them at the same time. They offer a useful and highly elegant manner jewelry display. They come in various styles, colors and shapes and they can easily blend in with all sorts of inner decoration styles. Their clear and transparent view is a rather big plus as they will display your products before any customer or any passer by in the window store with ease. Jewelry Stackable Trays represent a type of trays that are easily stacked together and they are fixed to a stand that allows them to move and rotate freely. Their target is to display and store as many items of jewelry as possible while saving up plenty of space in your store. They are very efficient and convenient to have around as they can easily accommodate a rather significant number of jewelry products. They can be readily stacked in one row or they can be easily spread out so that they can present each item they are storing. On top of that, this kind of trays provide an easy and facile transportation of your items as they can be moved around the store with ease whenever you need to. They are safely kept in the stackable trays while they can be beautifully displayed before each one of your customers as well! Insert Tray / Outer Tray are generally part of jewelry display cabinets, boxes or organizers but they can be just as well used on their own. They are perfect for intricate exhibition sets and they will beautifully display all sorts of jewelry with ease, regardless of their size; they are not divided into slots or smaller compartments; therefore, they will readily accommodate even the bigger and heavier items of jewelry. You can arrange them in various and diverse ways in order to display them in a more interesting and captivating manner. Insert trays or outer trays offer a simple yet elegant way of jewelry display. Like most trays, they are also rectangular or square shaped. In addition to displaying jewelry, they can be very useful whenever you need to keep it safely stored as well. They do not take up much space and they are definitely very smartly designed in order to present as many jewelry items as possible. 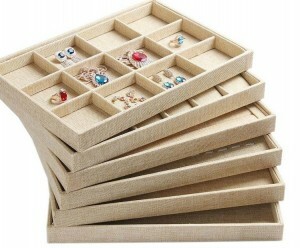 Inserts For Drawers trays stand for the kind of trays that are precisely meant to be part of jewelry display drawers. Those are usually part of jewelry cabinets as well. They can be also used as individual trays on their own as well. They are ideal for the display of jewelry throughout the store so you can easily scatter numerous insert trays around the store with all sorts of jewelry. They can present a large number of items and they do not take up almost any space whatsoever, therefore making them perfect for more crowded placed or window cases. They are efficient and optimal and they come in plenty of shapes, shades, sizes and designs. They are usually simple but they can also present beautiful and intricate motifs as well. They are created in order to store and keep safe jewelry items but they can be just as well utilized for the display of these items too. Display or showcase trays are mainly intended for the beautiful and efficient display of diverse kinds of jewelry. Display trays are used in jewelry store’s window cases or they can be arranged on any surface around the store, on vanities, desks, dressing tables, vertical surfaces or any other place, depending on their style and design. They aim to exhibit any type of jewelry in an attractive, unique and enticing way. They come in diverse sizes, designs and styles that are all meant to catch any customer’s or passer’s by eye. Their styles vary from retro or vintage to futuristic and modern. They all provide creative and innovative ways of displaying jewelry and they strive to offer a beautiful and admirable method of displaying your products before anyone else. Display or showcase trays are meant to be admired, appreciated and to present gorgeous items of jewelry like earrings, rings, brooches, necklaces and so on. Jewelry Organizer Trays have the purpose of smartly and efficiently organizing all of your jewelry items in a tidy, chic and intelligent way. These trays are often divided into variously sized slots or compartments that will help with providing a more proficient and professional look. They organize and categorize your jewelry products by size, use, color, shape and any other criterion. They come in diverse colors, designs, shapes and styles as well in order to mingle with the style of decoration of your store. Jewelry Organizer Trays aim to achieve an intelligent and effective compartmentalization of your jewelry that will help you find them and organize them way easier. They will undoubtedly prove to be very useful and convenient. In addition to all that, jewelry organizer trays can be used as ways of displaying these items of jewelry in the window case or in the store in a neat and chic way. 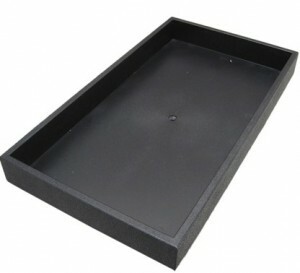 Jewelry Storage Trays are destined for the storing and safe keeping of jewelry items. They are meant to keep your products safely and securely stored and to protect them from all sorts of damage like scratching, denting, breaking and so on and so forth. With the help of these jewelry storage trays, you will be able to keep your precious and fragile items of jewelry anywhere without having to worry about their safety. They are efficient, trustworthy and they are meant to organize and keep everything safe and secured in a professional manner. They can store all sorts of jewelry as they come in diverse sizes, from tiny to large, shapes – usually geometrically shaped, as most trays are – and diverse and colorful shades for a nicer and lovelier look. Jewelry storage trays are a professional, effective, reliable and definitely elegant method of jewelry storage that will keep all of your products far from any kind of harm. Jewelry Flocked Tray Liners are the kind of jewelry trays that are divided into slots of various size that are usually square shaped or rectangularly shaped. This kind of tray is ideal for the display, storage and organizing of all sorts of items of jewelry as they provide a compact yet efficient and intelligent manner of jewelry compartmentalization. The slots come in multiple sizes so as to fit and accommodate many kinds of jewelry, from small jewelry such as pairs of earrings and ear studs to larger jewelry like necklaces, bracelets and so on. They are perfect for both displaying jewelry in the jewelry store or for safely storing them. Jewelry Flocked Tray Liners provide a highly efficient and professional display of jewelry. They are usually neutral colored, such as black, white or dark grey, so they will be easily integrated into the window case of your store or anywhere else around the store as well. Vacuform inserts represent trays made of a plastic material called vacuform. They are sturdy enough to sustain even larger items of jewelry as well yet they are very light, thus facilitating the transportation of jewelry at the same time! They are, like most jewelry display trays, rectangularly or square shaped and they are obviously divided into a large number of square slots. These lots come in various sizes so as to accommodate any kind of jewelry design. They can be readily stacked and carried everywhere you need to place your jewelry while protecting them as well. Vacuform inserts are easy, efficient and they can be relied on at all times! They can be used for the display of jewelry in the store’s window display too. Their colors vary as well so you can pick the one that suits the interior decoration of your store. Vacuform inserts are very facile to use and highly efficient when it comes to sorting and organizing jewelry items. 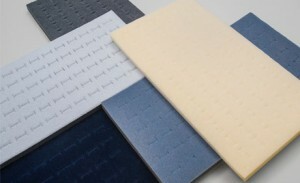 Jewelry Pad Inserts refer to the soft and delicate material that jewelry trays, drawers, cabinets are covered with. They offer a dainty and elegant display and storage of your items while treating them with case, given their soft material. Jewelry pad inserts are meant to keep all items of jewelry from getting chipped, dented, scratched or damaged in any other way. They can be used on their own as well, therefore offering a safe and gentle conduct of your more fragile items of jewelry even when they are being displayed in the jewelry window case. They are meant to treat your products with care and to display and store them in a satisfactory and efficient manner. They also come in all colors, from elegant black to bright red and royal dark purple and they will definitely blend in a beautiful way with any kind of interior decoration as well. Foam inserts are a rather common spread and customary manner of displaying or organizing jewelry products amongst all jewelry stores. They are a true light weight, therefore they won’t prove to be any problem whenever you need to move the items around, and they are well and smartly organized as they are divided into a rather significant number of slots that will safely and efficiently store each one of your item of jewelry. Foam inserts are soft yet reliable and they will always prove to be very satisfactory whenever you need them! They are very useful to have around the store, regardless if you intend to use them for the display of jewelry, organizing them or for their storage. They are usually dark colored so they are also rather elegant without being too kitsch and they will easily blend in with any kind of decoration without a problem as well!